Cloning preserves the character of your favorite plant. Cloning can make an ocean of green out of a single plant, so it is a powerful tool for growing large crops, and will fill a closet quickly with your favorite genetics. When you find the plant you want to be your "buddy" for the rest of your life, you can keep that plant genetic character alive for decades and pass it on to your childrens children. Propagate and share it with others, to keep a copy, should your own line die out. A clone can be taken from a clone at least 20 times, and probably more, so don not worry about myths of reduced vigor. Many reports indicate it is not a problem. Cloning will open you to the risk of a fungus or pests wiping out the whole crop, so it is important to pick plants that exhibit great resistance to fungus and pests. Pick the plant you feel will be the most reliable to reproduce in large scale, based on health, growth rate, resistance to pests, and potency. The quality of the high, and the type of buzz you get will be a very important determining factor. If a plant is harvested, you can sample it, and decide if you want to clone it. Pick your favorite 2 or 3 distinctly different types of plants to clone, based on trying the harvested plants. The plants you want to clone can be regenerated by putting them in constant light. In a few weeks, you will have many vegetative cuttings available for cloning and preserving your favorite plants. Always keep a mother plant in vegatative mode for any strain you want to keep alive. If you flower all your clones, you may end up killing off a strain if you don not have any plant devoted to being a mother. I killed off a sacred strain accidentally this way; my harvested plants failed to regenerate and the strain would have died completely had not previously igven it to friends to grow it as well. I was in luck, and a buddy set me up with another clone of this strain to grow as a mother plant for a new crop of clones. Cloning goes quickest with the liquid rooting solutions, in a warmed, aerated tray, with subdued lighting and high humidity. Placing cuttings into 1" rockwool cubes in a covered tray works great too. In a closet, you can make space above the grow area so that the heat of the lamp warms the tray (passive collecting) and spare the expense and hassle of the aquarium heater ($24) or agricultural heating pad w/ thermostat (pricey). A double 4" fluorescent lamp will be perfect. Leave lamps on for 24 hours a day. Cuttings should root in 2-3 weeks. I found only one liquid rooting hormone solution that was not over $10. (Olivia Gel was $12 for a 1.6 ounce bottle. Geez, what is this stuff, gold?) I found some dipNgrow for $9, considered myself lucky, and got a tray and clear cover for $7. A clear tray cover or greenhouse encloser is needed to bring up humidity to 90% (greenhouse levels). Liquid rooting hormone seems to be much more effective than powders. Some types available are Olivia, Woods, and dipNgrow. Mix a weak cloning solution of high P plant food (such as Peter 5-50-17), trace elements, and epsom salts and then dip plants in rooting solution per instructions on label. All of the above nutrients should be added in extremely small amounts, 25% of what would normally be used on growing plants. Or use a premade solution such as Olivia Rooting Solution. Corn syrup has been reported to supplement the sugars needed by the plant during cloning, since it consists of plant sugars. Buy a tray with a clear cover made for rooting at an indoor gardening supply house. You must keep humidity very high for the clones. Put cuttings in an ice chest with cellophane over the top and a light shining down if you don not want to pay for the grow tray and cover. 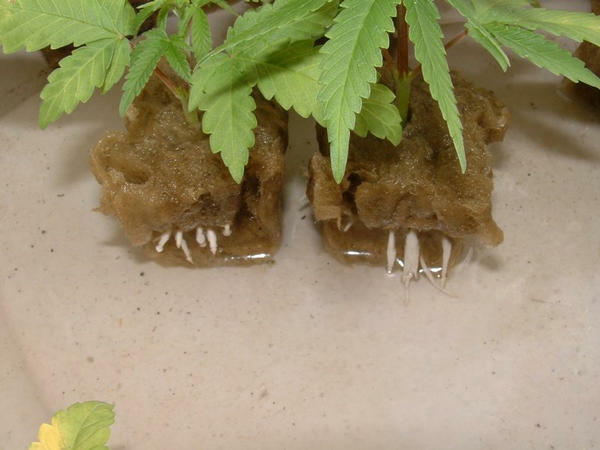 It is also possible to directly place a dipped cutting in a moist block of floral foam with holes punched, or vermiculite in a cup; be sure to root cuttings in a constantly moist medium. Jiffy peat cubes are not recommended, as published reports indicate results were not good for rooting clones. Place starter cubes in tray of solution. Check twice a day to be sure cubes are moist, not drenched, and not dry. After about 2-3 weeks, rootlets will appear at the bottom of the pods. Transplant at this point to growing area, taking care not to disturb any exposed roots. 2. Dip in Rootone, then spear stem about 2" deep in 16 oz. cups of 1/2 vermiculite, 1/2 perlite, which are kept in a stryrofoam cooler. 3. Spray cuttings with a VERY mild complete fert. soln. Cloning is not as easy as starting from seed. With seeds, you can have 18" tall plants in 6 weeks or less. With clones, it may take 6 weeks for the plant to sprout roots and new growth. Seeds are easily twice as fast if you have empty indoor space being wasted that needs to be put to use quickly. Always breed a few buds for seeds, even if you expect to be cloning most of the time, you could get wiped out, and have nothing but your seeds left to start over. Cloning in rockwool seems to work great, and no air pump is needed. I paid $9 for 98 rockwool starter cubes. A plastic tray is available ($.95) that holds 77 cubes in pockets allowing the cubes to be held in a tray of nutrient solution. They are easily removed and placed in a larger rockwool growing cube when rooted.